Hand made in Italy, there is nothing to match the Sonus faber loudspeakers for both quality of finish and sound. These are true luxury products with a reputation that is deserved in every way. 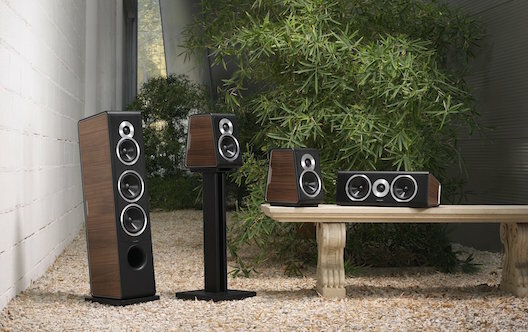 With the Chameleon speaker collection, Sonus faber brings all the iconic elements that the Vicenza based company is known for to a wider, contemporary audience. The introduction of a new model is always an event. You open a Sonus faber box and the rich aroma of leather, lacquer and maybe even a hint of coffee fills the room. Ranging from just $1300 for the centre to $5000 for the pair of the awesome floorstanders, the new Chameleon collection draws on all of Sonus faber's experience to produce 3 models that are at once affordable and totally desirable. Being Sonus faber you'll know that they will sound fantastic. The first thing you'll see the Chameleon collection is that, yes - they can change colours at will. This is a great idea on many levels - first this gives you more choice from the outset. But it also means you can renew the appearance of your speakers at any stage in the future should you change the room they are in. And while we'd love to think accidents will never happen, this means that should the speakers ever look less than new, you can bring them back to mint in a way that just isn't possible with any other design. Because Sonus faber speakers are designed to last a lifetime. The two stereo speaker models, simply denoted 'B' for the smaller and 'T' for the floorstander are each refinements of long running and classic designs. The B is effectively the 5th iteration of the original compact Concertino model - the size, sloping front, with leather wrap and side panels give a sense of continuity. Likewise the floor standing model traces its lineage back to the original GP - Grand Piano model. Having sold all of these models and versions over time, we've always been impressed by how Sonus faber continually re-invent and refine the designs with an appreciable improvement in sound quality at each step. Remarkably the dollar price of the models has remained almost unchanged over 15 years, yet all aspects of their performance and construction have improved. What has changed most dramatically is the way in which Sonus faber now define the absolute top end of the market with speaker systems such as the Aida. This has two direct influences on the new Chameleon models. Firstly the expectations of sound quality are greatly increased as the same team that develop speakers such as the Aida will listen to the Chameleon and want to hear elements of that state of the art performance represented, regardless of the lower cost of the entry level models - to carry the Sonus faber brand, any model must sound exceptional. Secondly the research facilities, engineering and materials that are employed in the flagship models within the Vicenza factory flow directly into the production of the Chameleon collection. No-one else is able to apply this level of expertise and quality to a comparably priced speaker. 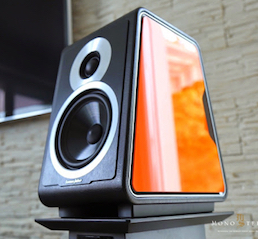 This is part of what sets Sonus faber above the mass market. If you have a close look at the pic showing the exposed side of the little Chameleon B you'll see that there is an extremely rigid looking steel frame that the side panels mount into. (Plenty of more detailed pics here - thanks Mono&Stereo) This will do much for the sonic performance of the cabinet. And the side panels are effectively de-coupled which adds a further sonic benefit by reducing resonance - the ability to change colours is actually not just a cosmetic advantage - it makes for better sound too. Add to this a whole seres of driver and detail improvements and you have the makings of a very fine speaker system. Which model best suits you? 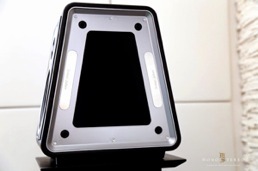 The small Chameleon B is the classic Sonus faber stand mount speaker. While they will still sound great on shelves, they really are best on good quality stands as you'll be able to carefully optimize the position - we've got a really good new stand from Alphason which is perfect in size and looks the part while still being very reasonably priced. The Chameleon B features a unique downward firing but front slot ported vent - it's a bit hard to explain till you see it but the key thing is it works. Sonus faber speakers are all about air and space - set them up correctly and you'll immerse yourself in a performance where the speakers effectively disappear. Detail is the key with the Chameleon B - if you have an amplifier that can transmit a wealth of musical information, then the Sonus fabers will reproduce it. Both the NuPrime IDA-8 and Quad Vena integrated amplifiers are natural partners for the Chameleon Bs. The Quad in smaller areas where you are after a richer warmer sound, the NuPrime when you have space, want every last bit of detail and can make the most of the extra power and resolution that NuPrime provide. While the Chameleon B is very much a perfectly formed compact speaker, the floor standing model 'T' (which may or may not stand for Tower) is a substantial speaker system by any measure. These are designed for larger rooms and have both high efficiency and some serious bass abilities. You'll want to have plenty of free space around them and given their visual presence and the cool colour choices, these speakers will be a feature in your room. Justifiably so! The combination of large bass drivers and an expansive front port do demand your amplifier has control to deliver their best. But look to some serious power and control from NuPrime - either the larger integrated IDA-16 or even better ST-10 power amplifier matched with appropriate front end to get the Chameleon Ts really moving. From the foundations of the bass, the Chameleon's are a tremendously lucid and engaging speaker - perfect from making live recordings actually sound alive, be they large orchestral pieces or something a little more full-on. Sonus faber speakers are full of character and the Chameleon Ts are no exception - while they will tick all the serious audiophile boxes there is a lot more to music than analysis and strict accuracy. We love our own Sonus fabers because they flesh out recordings, transmitting some real emotion and adding something that we just don't hear with other brands. And that's why we think you'll enjoy these speakers so much. 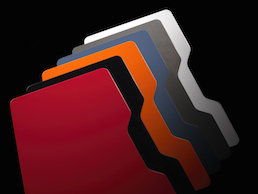 Choice of side panel of red, black, orange, blue, grey, or white included in price. Special Italian made matte real walnut wood panels extra so ask for pricing. Panels may be purchased separately so you can change them at will. With the Sonus faber brand, the hand finished cabinets, leather and colour choices you might think the Chameleons would be seriously expensive - here's the really good news - they are anything but. 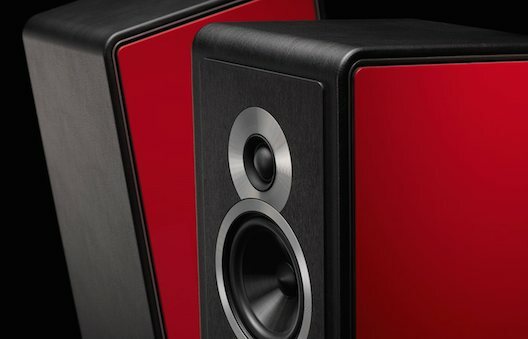 It might be the Italian economy or just the quirks of exchange rates but with the Bs at NZ$2000 the pair and the large Ts at NZ$5000, these are easily our best value and most desirable new speakers. Call us now on 0800 909 101 or or e-mail us for further information, current brochures and recommendations. Talk to us about your expectations, musical tastes and special requirements.